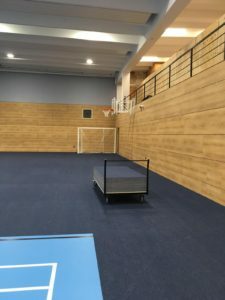 At DYNAMIK we excel in the manufacture and installation of sports surfaces plus we offer a complete one stop shop solution providing sports flooring, sports walling, line-marking, maintenance and floor protection all under one roof. Andreas Lamberth, Head of Campus & Estate Services at Newbold College of Higher Education, looked at many surface and wall options and made the decision to award the refurbishment project to DYNAMIK as we offer systems that omit soft wood construction by offering floor and wall solutions based on birch plywood construction. Birch Plywood construction has a high load capacity as well as tolerance to temperature or moisture deviations. This project highlights our DYNAMIK Sydney system finished in Sports Vinyl, our Solid, Perforated and Fabric Acoustic wall panels and our protective Giant Carpet Tiles. 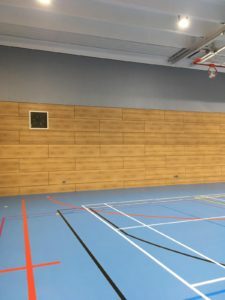 Andreas took a hands-on approach to his installation which transformed the 1960’s style hall into a sports centre fit for multi-sport, education and social events.